Santorini is the only volcanic island of Greece and its definite that its astonishing beauty is going to win you over before you even visit it .Its unique scenery with the multi-coloured cliffs overlooking Caldera, the majestic view and the amazing sunset of oia, together the white Cycladic houses embracing the cliffs guarantee to take your breath away. 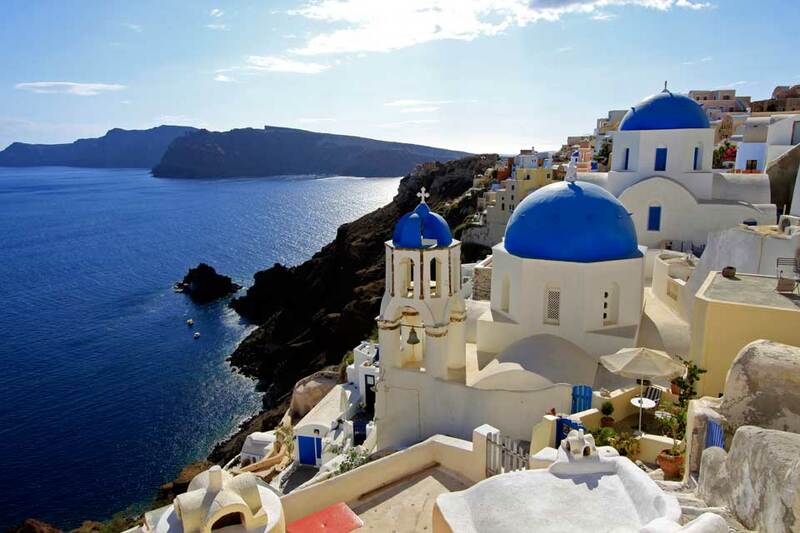 This is the reason why Santorini was voted as one of the 5 places of the world that someone must see. Those who have visited Santorini know that one time is never enough those who are planning on visiting the island must organize a trip worthy of Santorini’s fame This island draws thousands of tourist every year from May to October, but if you wish to be one step ahead Van rental is you travelling solution book your minivan on line at www.vanrental24.com and let the magic spread all around. You are finally here it is time to enjoy this world’s wonder after seeing Thira the Island’s capital with the pedestrianized streets filled with restaurants, hotels and souvenir-shops and since we are sure that you have already made a stop at the Museum of Prehistoric Thira the 17th century BC Minoan settlement of Akrotiri where you will see many displays and artefacts from this era all from derived from Akrotiri’s finds such as jug, vases frescoes etc. After this glimpse of history let your 12 seat minivan drive you to the amazing Fira . There are so many things for you to discover here that it is certain that you are going to lose truck of time. Let’s get things from the Start: Strolling through the tourist district of Fira is certainly a must do. Here you will find get carried away by the variety of shops with jewellery accessories. Continue your walk all the way to Agios Minas street which will lead you part way down the cliff from where you will have an overall aspect of Fira. After all these you will need to catch your breath, so enjoy a wonderful meal with local tastes and of course select one of the great Santorini’s wines. From Fira you will get in no time with minivan rentals to Santos winery it’s the only underground winery of Greece. The sightseeing tour is very detailed and the structure of the winery like a woven will catch your eye next destination is finally Oia you have heard so much about this unique spot there is no doubt about that so much so that photo album must be dedicated only to Oia. It has by far one of the most beautiful Sunsets in the world. This hilltop village is so gorgeous that it will be hard for you to believe that what you are seeing is actually true. You are going to repeat several times the phrase “I must be dreaming”. Do not neglect to visit the wonderful beaches of Santorini with the red rocks like Amoudi and Kamari a black pebble beach. The crystal waters and the beauty all around is of high value. 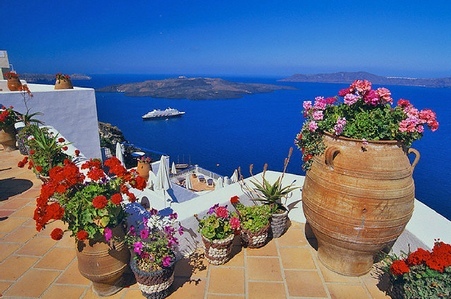 The last five years Santorini has become an ideal wedding destination. For this unique day in the life of every couple you cannot find a better and more romantic place than Oia. The smel of the sea and the red -orange colour of the sunset create a dreamy landscape. Van hire is also the best possible solution for those of you who have selected Santorini as your wedding destination. Your guests will have the opportunity to share these fantastic moments with you and explore Santorini easily and comfortably. Next stop the famous resort of Imerovigli only 2 Km from Fira and while the summer heat is intense you have nothing to worry about since you have the privilege of your 12 seat van rentals. Imerovigli is called the “Balcony of the Aegean” and has many beautiful churches for you to explore all constructed in the Cycladic Architectural style. Pay a visit to the church of Ai Stratis and the church of Saint Nicholas Imerovigli is truly spectacular and another famous sight is Skaros which the remains of a Venetian Castle built in 1207 by Marco Sanudo are found. All good things come to an end and now that you have created your own Santorini fairytale rest assure that this Agean Masterpiece is ready to welcome again you any time.